Add a marina touch to your deck or door with our Ahoy! 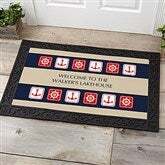 Nautical Personalized Doormat. A perfect accent piece for the lake house or poolside.